I think it is most likely you will find the chip marking as MLC. Edited 1 time(s). Last edit at 02/08/2019 05:39PM by bodhi. I've changed the env as you suggested, but the NAND still read only mode. [    0.022642] Feroceon L2: Cache support initialised. [    0.165257] RPC: Registered named UNIX socket transport module. [    0.165272] RPC: Registered udp transport module. [    0.165281] RPC: Registered tcp transport module. [    0.165289] RPC: Registered tcp NFSv4.1 backchannel transport module. [    0.962134] Installing knfsd (copyright (C) 1996 okir@monad.swb.de). [    0.962371] jffs2: version 2.2. (NAND) (SUMMARY)  Â© 2001-2006 Red Hat, Inc.
[    8.889061] 0x000000000000-0x000000100000 : "uboot"
[    8.903287] 0x000000100000-0x000010000000 : "rootfs"
[....] Cleaning up temporary files...[....] Cleaning /tmp...done. bound to 192.168.2.200 -- renewal in 3064 seconds. I've attached a photo of the chip and the datasheet. Edited 1 time(s). Last edit at 02/10/2019 11:17AM by dirkpitt74. Let's see if we can find out detailed info about this chip (google it). The chip is a SLC, not a MLC. In this thread I've find a complete bootlog of another Netgear Stora that have a Samsung NAND chip. The only difference with mine is the linux kernel version. I updated the rootfs to the 4.20.6 and now the chip is correctly recognized. [    0.005819] rcu: Hierarchical SRCU implementation. [    0.028742] Feroceon L2: Cache support initialised. [    0.190418] RPC: Registered named UNIX socket transport module. [    0.190435] RPC: Registered udp transport module. [    0.190445] RPC: Registered tcp transport module. [    0.190455] RPC: Registered tcp NFSv4.1 backchannel transport module. [    1.076719] Installing knfsd (copyright (C) 1996 okir@monad.swb.de). [    1.077075] jffs2: version 2.2. (NAND) (SUMMARY)  Â© 2001-2006 Red Hat, Inc.
[    9.559243] 0x000000000000-0x000000100000 : "uboot"
[    9.565641] 0x000000100000-0x000010000000 : "rootfs"
bound to 192.168.2.200 -- renewal in 3075 seconds. I think that the kernel 4.12 don't have the correct driver for Samsung NAND chip. I ask you to check if there are other issues to solve. > Stora that have a Samsung NAND chip. > now the chip is correctly recognized. 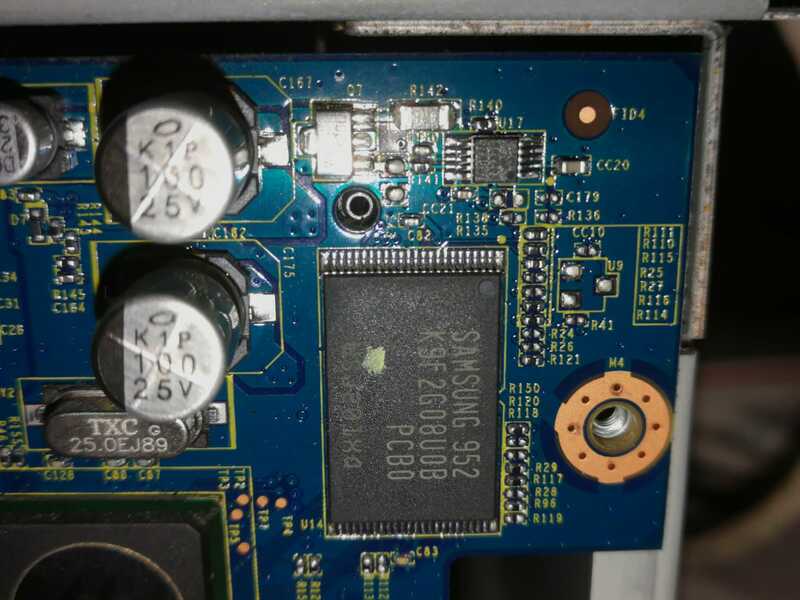 > correct driver for Samsung NAND chip. You should verify further to see everything is OK. The NAND is writable and it seems all OK, but ther is some other issue. After that the system freeze. I can only unplug the power cord and sometimes the system starts again but at other times I have to recreate the rootfs image on the usb stick because it has become inconsistent. It sounds like a hardware problem. And I don't have any suggestion for it other than: always use a good brand such as Sandisk for rootfs.